The Primitique: Attention Warrenton Shoppers! My trip to Warrenton was meant as a buying trip. I don't have a space or anything. However, I have committed to loading my truck with a few items to be sold to dealers at Warrenton. So, wanna jump on the bandwagon? Go to my Primitiques flickr page and even my house pictures and go shopping. Holler at me for prices. If it will fit in my truck, I will bring it with your promise to purchase at Theresa's Blog Party at 2pm, Sunday, March 29th at Zapp Hall. Or you can go ahead and pay me with paypal now. I'll park somewhere nearby and you will pick it up at my truck and do with it as you please. No delivery. No dragging. Just being near the blog party for pickup. Sound good? For those of you who can't make it to the Biggest Sale in Texas, well, I've got a little something for you. 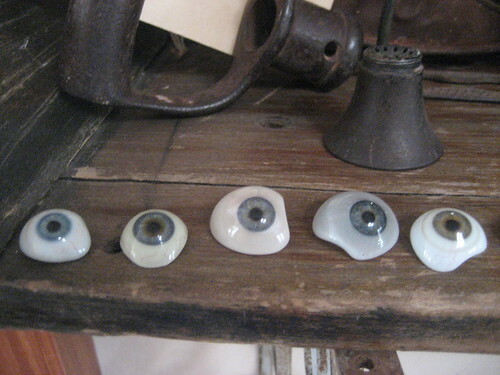 How bout a circa WWII glass, prosthetic eye? Your choice, $25 each. Or buy 3 or more at $20 each. Shipping will be extra, of course. You can go here to view all of the eyes. There are about 20 for sale. Some have red veins in them. There are Blue, Brown, Hazel, Green eyes. Your choice. Or I can randomly pick some for you. Fun stuff, eh? You can contact me at PrimitiquesNPoetry@yahoo.com with your Wish List. Would any of them give me 20/20 vision. Hope you have a great time at Warrenton. Sometime before I'm too old, I really want to go to Round Top. Maybe in the Fall! Girl, I'm so poor if steamboats were a dime a dozen, all I could do would be to run up and down the bank yelling "Ain't that cheap"! Keep your fingers crossed we are blessed at this show. My grandfather had a glass eye...put his eye out opening a package when he was a kid. (early 1900s) The glass eyes were expensive...later he'd be wrestling with his brother and his mother would yell at him to quit. He hollar back...it's ok mom, I've got my eye in my pocket! You stirred up a memory for me today...thanks! Hope to see you at the show! "Ain't that cheap? "...Debbie, you are cracking me up! Indeed! I hope this show ROCKS! I will be in reporter mode. I do believe I will have more time than money. So, lots of pics will be taken and lot of visiting will be had! Rock that show this weekend. Get rich and come back with an empty truck! OMG!! Eyes? Where do you find this stuff!!! BTW, did they sell?